If the Conservatives win the election, in three months time he will have to deliver on this promise, while also setting out a credible plan to tackle the government's soaring debt mountain. In other words, he will have to make substantial spending cuts. Which is why the Conservatives need to be very careful about adding to the problem already caused by ring-fencing the NHS and overseas aid. Sprinkling around spending goodies like £200m for new cancer drugs may deliver a short-term headline, but it makes fiscal life even more difficult should they form the next government. 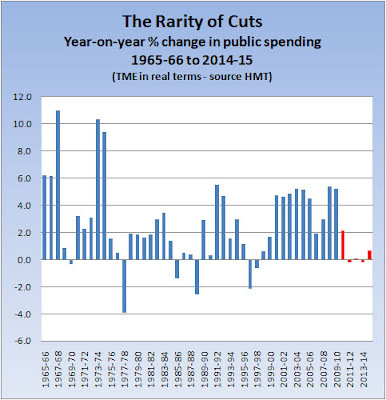 The biggest cut by far was that achieved under the IMF cosh in 1977-78; it was driven by cuts in both current and capital spending; but note that even that legendary cut only amounted to 4% in real terms, and it was reversed within two years. 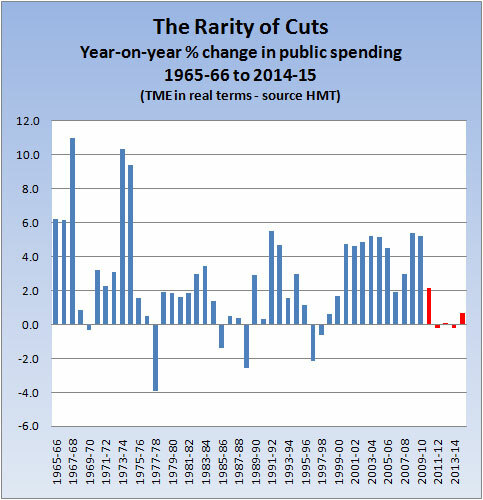 The two smaller cuts under Lawson in the late 80s reflected a recovering economy trimming welfare spending; but a key driver was years of severe restraint in current spending programmes, combined with further deep cuts in capital spending. In the mid-90s, Clarke managed to cut spending two years on the trot (the second helpfully delivered to his successor in 1997-98); a rapidly recovering economy helped, but once again, a key driver was capital spending, which fell by 35% in two years. 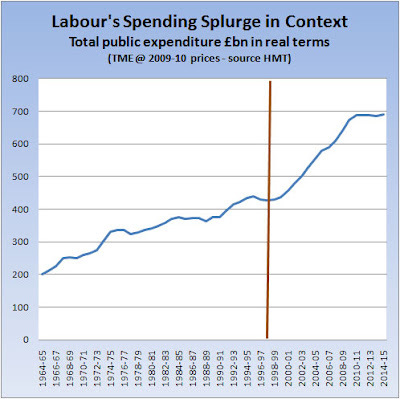 Labour's spending plans (shown above in red) deliver no net cuts: as we've blogged before, they amount to an actual increase in total spending over the next 4 years. This record puts the forthcoming task into its full horrific context. Because depending on whose estimates of the structural fiscal deficit you believe, we need to cut spending by between 10% and 20% in real terms - and also, keep it down afterwards. Which is way outside the range of anything that any living Chancellor has ever achieved. And this time, capital spending is so much less to begin with. Back in the 70s public sector capital spending actually exceeded public borrowing - even when the latter ballooned. Which offered a fairly easy cuts target. However, in today's post privatisation world, public sector capital spending is much less than our huge deficit, so there is no easy option there. 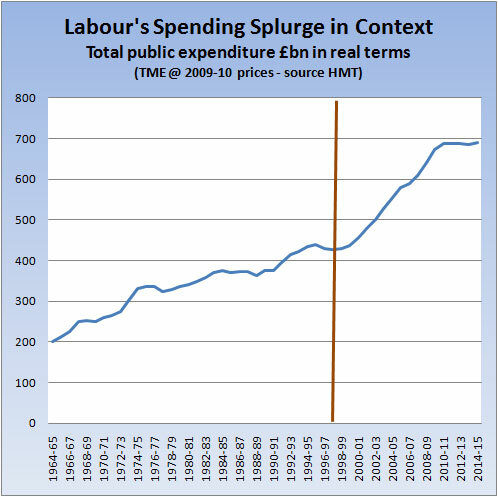 Spending has ballooned to such an extent that even a 20% cut from next year's planned level would still only get us back to the level of spending in 2004-05. Over the next month, politicians of all parties should try to remember this very simple fact: Britain cannot afford promises of yet more spending.